How can a fairy's blessing be such a curse? At her birth, Ella of Frell was the unfortunate recipient of a foolish fairy's gift—the "gift" of obedience. Ella must obey any order given to her, whether it's hopping on one foot for a day and a half, or chopping off her own head! But strong-willed Ella does not tamely accept her fate. Against a bold backdrop of princes, ogres, giants, wicked stepsisters, and fairy godmothers, Ella goes on a quest to break the curse—once and for all. In this incredible debut novel comes the richly entertaining story of Ella of Frell, who at birth was given the gift of obedience by a fairy. Ella soon realizes that this gift is little better than a curse, for how can she truly be herself if at anytime anyone can order her to hop on one foot, or cut off her hand, or betray her kingdom and she'll have to obey? Against a bold tapestry of princes, ogres, giants, wicked stepsisters, and fairy godmothers, Ella's quest to break the curse once and for all and discover who she really is is as sharply funny as Catherine, Called Birdy and as richly poignant as Beauty, and has all the marks of a classic in the making. 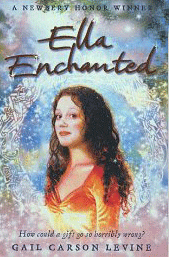 HarperCollins has prepared a teaching guide for Ella Enchanted.